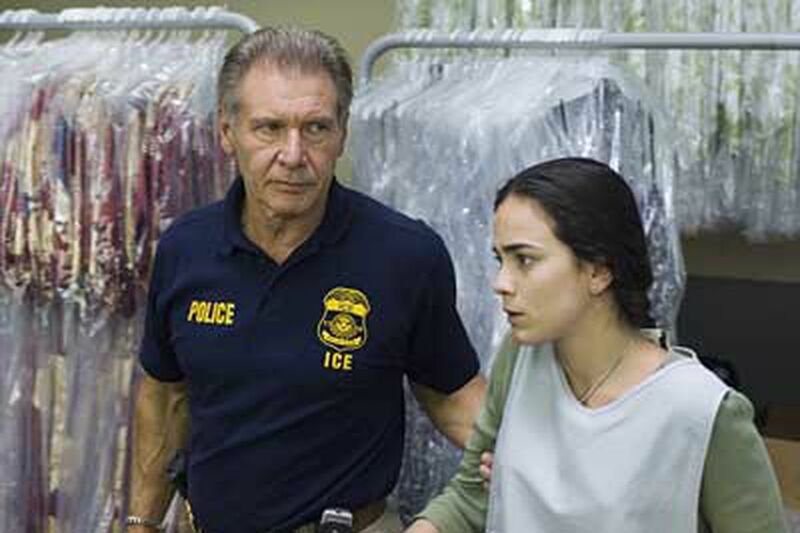 Tangled-up tale of immigrants in L.A.
Harrison Ford and Alice Braga in "Crossing Over." He plays an Immigrant and Customs Enforcement agent, she an undocumented worker. Once the director gets down to ground level, though, the picture looks markedly different. Looking from L.A. south to the Mexican border, Kramer sees immigrants - many of them undocumented and anxious to become legal. And he shows how they try to weave into the social fabric and in the process get all tangled up. A feverish, multistory affair cut from the same bolt as Crash and Traffic, Kramer's Crossing Over presents Southern California as an unraveling crazy quilt of a big tent. For every foreigner desperate to get in, there is a gatekeeper preventing it - or profiting from it. Similarly, in Kramer's obviously heartfelt movie about the risks many take to be in America, for every gripping plot turn taking you to the edge of your seat, there's one that has you shaking your head in disbelief. Harrison Ford - in his best role in years - and Cliff Curtis are the main reasons to see the film. They play Max and Hamid, ICE (Immigrant and Customs Enforcement) agents whose job is to pull out illegals like so many stray threads. They raid sweatshops and take into custody undocumented workers such as Mireya (Alice Braga). If she gets deported, who will care for her young son? Also in Kramer's patchwork are U.S.-raised children of immigrants, like Taslima (Summer Bishil) and Yong Kim (Justin Chon), who try to reconcile divided identities. If they assimilate, they become alienated from their families. If they are proud of their countries of origin, they don't fit in with their native-born peers. Taslima, who gives an impassioned classroom speech interpreted by some as Osama bin Laden propaganda, also arouses the suspicion of federal agents. And trying to stake a toehold are aspiring actors and singers (and sometimes lovers) Gavin (Jim Sturgess), from Britain, and Claire (Alice Eve), from Australia. In their attempts to score green cards, one games the gatekeepers and the other is gamed by them. Every drama needs a villain. This overstuffed melodrama has two. One is an Immigration and Naturalization Services adjudicator (Ray Liotta), who trades legal status for sexual favors. The other is . . . well, that would be giving away too much. Kramer, himself a naturalized American of South African origin, paints a composite portrait in frustration, grief and hopelessness. Occasionally, his screenplay signals a flash of humor - especially in the Sturgess story line. And happily, Kramer lets the gifted Curtis (the New Zealander of Maori descent who has played just about every ethnicity imaginable) deliver a soliloquy about what U.S. citizenship represents to those who fight so hard to earn what natives take for granted. Despite some very moving passages, almost all involving the low-key Ford, who has a bleeding heart under his ICE badge, and Curtis, Kramer's film doesn't come together like its obvious antecedents. Contact movie critic Carrie Rickey at 215-854-5402 or crickey@phillynews.com. Read her blog, Flickgrrl, at http://www.philly.com/philly/blogs/flickgrrl/.